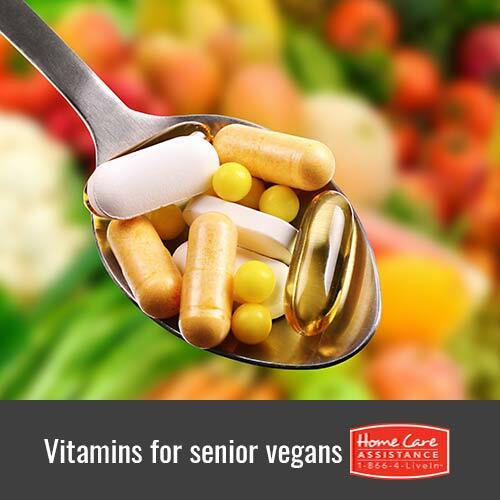 What Vitamin Supplements Should a Vegan Senior Take? Living vegan means a person does not consume any animal products or byproducts such as meat, milk, and eggs. If your senior loved one follows this diet, Harrisburg elderly care experts suggest you keep your eye out to make sure it is supplemented with these vitamins. If your loved one lives in a climate where most days are sunny and he or she spends a lot of time outside, a vitamin D supplement may not be necessary. However, for the majority of vegans, vitamin D supplementation is needed. The reason this vitamin is so important is because it helps the body absorb calcium and keeps bones from becoming brittle. Vitamin D is especially crucial for senior vegans who may require as much as 1000 international units (IUs) of vitamin D every day, much more than younger people. Seniors are often more prone to ill effects from low calcium levels than their younger counterparts, so supplementation either in fortified foods or vitamins is vital. Also commonly referred to as “good” fats, omega-3 fatty acids are important sources of the healthy kind of fat all seniors need in their diets. Omega-3 fatty acids control neural communications and blood clotting, making them vitally important to help the brain communicate with the nerves. Seniors especially need omega-3 fatty acids because an appropriate level may help ward off dementia. Consuming these fats may also lead to longer lifespans. Flaxseed, soybeans, tofu, leafy greens, and canola oil all contain omega-3 fatty acids, but senior vegans who don’t regularly include these foods in their diets should take a supplement. Calcium helps bones stay strong and keeps the immune system healthy. This is especially essential for older people who can become seriously ill from an initially minor illness. Because of this, seniors are advised to include more calcium in their diets than younger people do—up to 1200 IUs. Some studies used to suggest those living a vegan diet didn’t require as much calcium, but other studies indicate this is a false claim. For seniors who are vegan, calcium supplementation to reach the 1200 IUs recommended daily is extremely important in maintaining optimal health. Generally, a calcium supplement of 250-300 mg per day is sufficient if your loved one also includes other sources of calcium in the diet at all three meals. Otherwise, a larger supplement may be necessary. Interested in learning more about senior health and nutrition? Reach out to the senior care experts at Home Care Assistance. We provide professional part-time and 24-hour care in Harrisburg, and our caregivers can help ensure your loved one’s dietary needs are being met by assisting with grocery shopping, preparing nutritious meals, and much more. For more information on our senior care services, call a Care Manager at (717) 540-4663 to schedule a free in-home consultation.